ALL GIRLS WEEKEND follows a group of young women as they go on a trip to rekindle their friendship. Things go wrong and they find they are battling themselves and an unseen force. A somewhat by the numbers horror film is spruced up by an excellent cast who care enough to try and sell the story on screen. Yes we've been here before, but the the actresses work over time to make you feel like you're watching characters instead of bored people getting a pay check. Give the film points for having me pause the screener while I went to get popcorn. 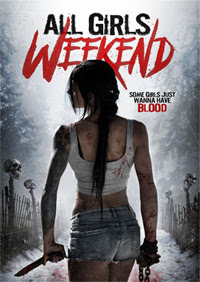 Well done, well made and highly entertaining, ALL GIRLS WEEKEND is very recommended for anyone who just wants a good horror film and has run through all of the biggies.